John “Jack” Hughes Hall was born in 1916 into a well-to-do family on Long Island. He graduated from Princeton University in 1935. Between ‘35 and ‘46 he traveled, wrote for newspapers and served in the army. He first came to Wellfleet in the late ‘30s, taking to the landscape immediately which he described as ‘manageable’. He bought 180 acres and a very old farm compound on Bound Brook Island for $3,500 from Katie Dos Passos, wife of the writer John Dos Passos. 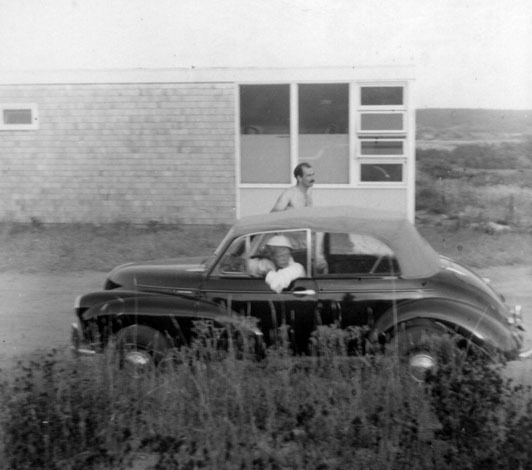 Jack Hall and his close friends, Jack Phillips and Hayden Walling, were the three self-taught, designer/builders in Wellfleet who created a welcoming environment for the European Modernists who arrived in the mid ‘40s. In 1946, Hall started his own design build practice in Wellfleet which he continued intermittently until he retired. Projects included the Peter’s Hill Restaurant building, the Hatch Cottage, and many studios, renovations and additions. Beginning in 1956, he worked for a number of firms in New York City including Nardin and Radoczy, Tom Lee Ltd., Hughes & Hood and George Nelson and Company. His study of industrial design led to work on a number of major traveling exhibitions for the US Information Service including Graphics USA in ’63 with Ivan Chermayeff (son of Serge Chermayeff). While with Hughes and Hood he designed many showrooms in the United States and Europe for the Fieldcrest Mills Company. In 1959 he spent four months in Moscow helping to assemble ‘The Jungle Gym,’ George Nelson’s contribution to the American National Exhibition. He worked with Charles and Ray Eames on a light fixture in 1964 and designed a café table for the Museum of Modern Art’s restaurant. Hall taught at Parsons School of Design’s Industrial Design Department in 1957-58 and had a simu-ltaneous private architectural practice in New York, executing many townhouse renovations (including one for his friends, Serge and Barbara Chermayeff). Although when Hall first came to Wellfleet he had an old Rolls Royce and was sometimes referred to as the ‘Squire of Bound Brook,’ he become a beloved fixture in town, especially after moving there full time in the early ‘70s. He was a serious, lifelong, painter and writer. Hall’s last wife, Marty, was close to Connie Breuer and often would sing at parties while Connie accompanied on jazz piano. Jack Hall died in the winter of 2003 in Wellfleet.